iptables is a command line utility for configuring Linux kernel firewall implemented within the Netfilter project. The term iptables is also commonly used to refer to this kernel-level firewall. It can be configured directly with iptables, or by using one of the many console and graphical front-ends. iptables is used for IPv4 and ip6tables is used for IPv6. Both iptables and ip6tables have the same syntax, but some options are specific to either IPv4 or IPv6. Arno's firewall — Secure firewall for both single and multi-homed machines. Very easy to configure, handy to manage and highly customizable. Supports: NAT and SNAT, port forwarding, ADSL ethernet modems with both static and dynamically assigned IPs, MAC address filtering, stealth port scan detection, DMZ and DMZ-2-LAN forwarding, protection against SYN/ICMP flooding, extensive user definable logging with rate limiting to prevent log flooding, all IP protocols and VPNs such as IPsec, plugin support to add extra features. ferm — Tool to maintain complex firewalls, without having the trouble to rewrite the complex rules over and over again. It allows the entire firewall rule set to be stored in a separate file, and to be loaded with one command. The firewall configuration resembles structured programming-like language, which can contain levels and lists. FireHOL — Language to express firewalling rules, not just a script that produces some kind of a firewall. It makes building even sophisticated firewalls easy - the way you want it. Firetable — Tool to maintain an IPtables firewall. Each interface can be configured separately via its own configuration file, which holds an easy and human readable syntax. firewalld (firewall-cmd) — Daemon and console interface for configuring network and firewall zones as well as setting up and configuring firewall rules. Shorewall — High-level tool for configuring Netfilter. You describe your firewall/gateway requirements using entries in a set of configuration files. Uncomplicated Firewall — Simple front-end for iptables. PeerGuardian (pglcmd) — Privacy oriented firewall application. It blocks connections to and from hosts specified in huge block lists (thousands or millions of IP ranges). Vuurmuur — Powerful firewall manager. It has a simple and easy to learn configuration that allows both simple and complex configurations. The configuration can be fully configured through an ncurses GUI, which allows secure remote administration through SSH or on the console. Vuurmuur supports traffic shaping, has powerful monitoring features, which allow the administrator to look at the logs, connections and bandwidth usage in realtime. Firewall Builder — GUI firewall configuration and management tool that supports iptables (netfilter), ipfilter, pf, ipfw, Cisco PIX (FWSM, ASA) and Cisco routers extended access lists. The program runs on Linux, FreeBSD, OpenBSD, Windows and macOS and can manage both local and remote firewalls. firewalld (firewall-config) — Daemon and graphical interface for configuring network and firewall zones as well as setting up and configuring firewall rules. Gufw — GTK-based front-end to ufw which happens to be a CLI front-end to iptables (gufw->ufw->iptables), is super easy and super simple to use. PeerGuardian GUI (pglgui) — Privacy oriented firewall application. It blocks connections to and from hosts specified in huge block lists (thousands or millions of IP ranges). iptables is used to inspect, modify, forward, redirect, and/or drop IP packets. The code for filtering IP packets is already built into the kernel and is organized into a collection of tables, each with a specific purpose. The tables are made up of a set of predefined chains, and the chains contain rules which are traversed in order. Each rule consists of a predicate of potential matches and a corresponding action (called a target) which is executed if the predicate is true; i.e. the conditions are matched. iptables is the user utility which allows you to work with these chains/rules. Most new users find the complexities of linux IP routing quite daunting, but, in practice, the most common use cases (NAT and/or basic Internet firewall) are considerably less complex. The key to understanding how iptables works is this chart. The lowercase word on top is the table and the upper case word below is the chain. Every IP packet that comes in on any network interface passes through this flow chart from top to bottom. A common source of confusion is that packets entering from, say, an internal interface are handled differently than packets from an Internet-facing interface. All interfaces are handled the same way; it's up to you to define rules that treat them differently. Of course some packets are intended for local processes, hence come in from the top of the chart and stop at <Local Process>, while other packets are generated by local processes; hence start at <Local Process> and proceed downward through the flowchart. A detailed explanation of how this flow chart works can be found here. raw is used only for configuring packets so that they are exempt from connection tracking. filter is the default table, and is where all the actions typically associated with a firewall take place. nat is used for network address translation (e.g. port forwarding). mangle is used for specialized packet alterations. security is used for Mandatory Access Control networking rules (e.g. SELinux -- see this article for more details). In most common use cases you will only use two of these: filter and nat. The other tables are aimed at complex configurations involving multiple routers and routing decisions and are in any case beyond the scope of these introductory remarks. Tables consist of chains, which are lists of rules which are followed in order. 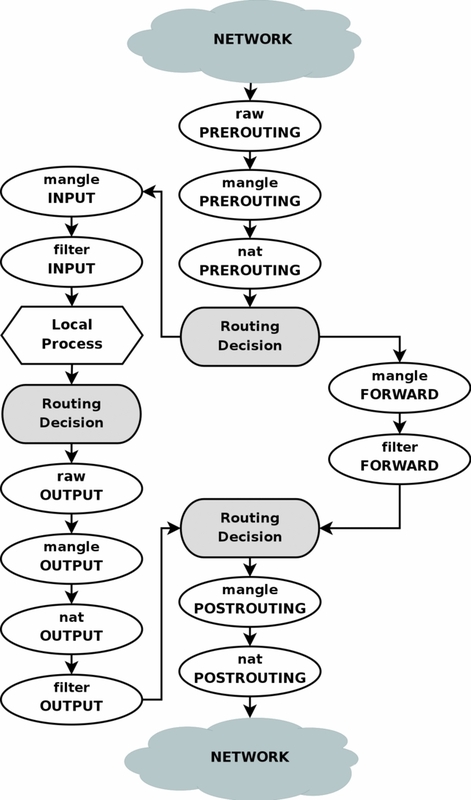 The default table, filter, contains three built-in chains: INPUT, OUTPUT and FORWARD which are activated at different points of the packet filtering process, as illustrated in the flow chart. The nat table includes PREROUTING, POSTROUTING, and OUTPUT chains. See iptables(8) for a description of built-in chains in other tables. By default, none of the chains contain any rules. It is up to you to append rules to the chains that you want to use. Chains do have a default policy, which is generally set to ACCEPT, but can be reset to DROP, if you want to be sure that nothing slips through your ruleset. The default policy always applies at the end of a chain only. Hence, the packet has to pass through all existing rules in the chain before the default policy is applied. 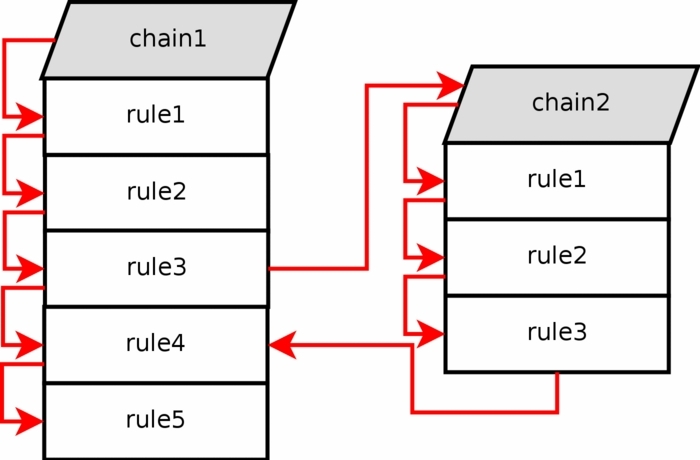 User-defined chains can be added to make rulesets more efficient or more easily modifiable. See Simple stateful firewall for an example of how user-defined chains are used. Packet filtering is based on rules, which are specified by multiple matches (conditions the packet must satisfy so that the rule can be applied), and one target (action taken when the packet matches all conditions). The typical things a rule might match on are what interface the packet came in on (e.g eth0 or eth1), what type of packet it is (ICMP, TCP, or UDP), or the destination port of the packet. Targets are specified using the -j or --jump option. Targets can be either user-defined chains (i.e. if these conditions are matched, jump to the following user-defined chain and continue processing there), one of the special built-in targets, or a target extension. Built-in targets are ACCEPT, DROP, QUEUE and RETURN, target extensions are, for example, REJECT and LOG. If the target is a built-in target, the fate of the packet is decided immediately and processing of the packet in current table is stopped. If the target is a user-defined chain and the fate of the packet is not decided by this second chain, it will be filtered against the remaining rules of the original chain. Target extensions can be either terminating (as built-in targets) or non-terminating (as user-defined chains), see iptables-extensions(8) for details. A network packet received on any interface traverses the traffic control chains of tables in the order shown in the flow chart. The first routing decision involves deciding if the final destination of the packet is the local machine (in which case the packet traverses through the INPUT chains) or elsewhere (in which case the packet traverses through the FORWARD chains). Subsequent routing decisions involve deciding what interface to assign to an outgoing packet. At each chain in the path, every rule in that chain is evaluated in order and whenever a rule matches, the corresponding target/jump action is executed. The 3 most commonly used targets are ACCEPT, DROP, and jump to a user-defined chain. While built-in chains can have default policies, user-defined chains can not. If every rule in a chain that you jumped fails to provide a complete match, the packet is dropped back into the calling chain as illustrated here. If at any time a complete match is achieved for a rule with a DROP target, the packet is dropped and no further processing is done. If a packet is ACCEPTed within a chain, it will be ACCEPTed in all superset chains also and it will not traverse any of the superset chains any further. However, be aware that the packet will continue to traverse all other chains in other tables in the normal fashion. There are many modules which can be used to extend iptables such as connlimit, conntrack, limit and recent. These modules add extra functionality to allow complex filtering rules. Then start the iptables.service unit. As with other services, if you want iptables to be loaded automatically on boot, you must enable it. iptables rules for IPv6 are, by default, stored in /etc/iptables/ip6tables.rules, which is read by ip6tables.service. You can start it the same way as above. If you edit the configuration file manually, you have to reload iptables. The basic command to list current rules is --list-rules (-S), which is similar in output format to the iptables-save utility. The main difference of the two is that the latter outputs the rules of all tables per default, while all iptables commands default to the filter table only. If the output looks like the above, then there are no rules (i.e. nothing is blocked) in the default filter table. An other table can be specified with the -t option. To show the line numbers when listing rules, append --line-numbers to that input. The line numbers are a useful shorthand when #Editing rules on the command line. The -F command with no arguments flushes all the chains in its current table. Similarly, -X deletes all empty non-default chains in a table. Individual chains may be flushed or deleted by following -F and -X with a [chain] argument. Rules can be edited by appending -A a rule to a chain, inserting -I it at a specific position on the chain, replacing -R an existing rule, or deleting -D it. The first three commands are exemplified in the following. First of all, our computer is not a router (unless, of course, it is a router). We want to change the default policy on the FORWARD chain from ACCEPT to DROP. Warning: The rest of this section is meant to teach the syntax and concepts behind iptables rules. It is not intended as a means for securing servers. For improving the security of your system, see Simple stateful firewall for a minimally secure iptables configuration and Security for hardening Arch Linux in general. The Dropbox LAN sync feature broadcasts packets every 30 seconds to all computers it can see. If we happen to be on a LAN with Dropbox clients and do not use this feature, then we might wish to reject those packets. Note: We use REJECT rather than DROP here, because RFC 1122 3.3.8 requires hosts return ICMP errors whenever possible, instead of dropping packets. This page explains why it is almost always better to REJECT rather than DROP packets. We have now replaced our original rule with one that allows 10.0.0.85 to access port 17500 on our computer. But now we realize that this is not scalable. If our friendly Dropbox user is attempting to access port 17500 on our device, we should allow him immediately, not test him against any firewall rules that might come afterwards! # iptables -I INPUT -p tcp --dport 17500 -s 10.0.0.85 -j ACCEPT -m comment --comment "Friendly Dropbox"
The LOG target can be used to log packets that hit a rule. Unlike other targets like ACCEPT or DROP, the packet will continue moving through the chain after hitting a LOG target. This means that in order to enable logging for all dropped packets, you would have to add a duplicate LOG rule before each DROP rule. Since this reduces efficiency and makes things less simple, a logdrop chain can be created instead. Explanation for limit and limit-burst options is given below. The above logdrop chain uses the limit module to prevent the iptables log from growing too large or causing needless hard drive writes. Without limiting an erroneously configured service trying to connect, or an attacker, could fill the drive (or at least the /var partition) by causing writes to the iptables log. appends a rule which will log all packets that pass through it. The first 10 consecutive packets will be logged, and from then on only 5 packets per minute will be logged. The "limit burst" count is reset every time the "limit rate" is not broken, i.e. logging activity returns to normal automatically. Logged packets are visible as kernel messages in the systemd journal. This will stop logging iptables output to /var/log/everything.log. ulogd is a specialized userspace packet logging daemon for netfilter that can replace the default LOG target. The package ulogd is available in the [community] repository. This page was last edited on 3 March 2019, at 05:39.